Sometimes in life we know that something needs to change, but we keep putting it off until it becomes big enough of an issue to force our hand and cause a change. For years, I’ve been wanting to move my sites off of the disparate cheap shared hosting where they previously lived and onto WPengine for a long time. In the last few months of 2015 I realized that my livelihood moving forward, as long as I work for myself, is all going to come through my own channels. I have become convinced over the years, after seeing slow and fast sites, of the importance of speed for websites. While it often won’t help smaller sites from an organic perspective, on very big websites with millions of pages you can see a lot of improvement in both traffic and conversions by speeding up your sites. All of my sites are on WordPress at this point because of the easy extendability of the open source platform. I began my career online developing on the Joomla platform and still remember looking at plugins that supported SEO friendly (SEF is what they called them) URLs. While Joomla worked fine for what I needed at the time, WordPress has moved ahead of them leaps and bounds so basically all my websites have been exclusively WordPress since 2011. I tried building out a few sites with other providers (SquareSpace, Shopify, etc) but they didn’t really suit my needs as someone with a web developer background who wants the freedom to extend things as I wish. These are the reasons I switched. Some of them affect SEO, some of them don’t. All of them could help you build your business. When I first started developing out my own websites back in 2010/2011, my cash situation did not allow me to invest in premium hosting. When I saw (what I thought was) a great deal from another host, I snapped it up and figured I’d be fine paying $4.99 a month for hosting. The one-click deployment of WordPress didn’t hurt either and everything worked together well enough to launch this site and a few others (all now defunct, ironically enough). Over time, as I bought a few more domains and worked on some other never-launched projects (I’m a big fan of doing this, by the way. I’ll write a post about it someday) and had issues with popular posts bringing down my site with the dreaded Error Establishing A Database Connection page, but I wasn’t trying to make any money directly from the sites at the time so I just let it be. As I mentioned above, I had quite a few sites and they were spread over different hosts – BlueHost, Dreamhost, and GoDaddy. Alongside the terrible site speeds, ongoing maintenance was becoming extremely cumbersome as I made updates to sites, moved different domain emails onto Google Apps, and needed to try new strategies to drive business. I could have used a tool like 1Password to remember all of my passwords, but why do that when you can actually streamline things? I’m not a fan of a patch where the real fix takes just as long and the job is done right. I don’t consider myself a developer, though I can use a FTP client and have no problem hacking around in HTML/CSS/PHP/JS (and also no problem calling in smarter people when I can’t solve it!). But when I’m running a business and the public facing site needs to work all the time, I can’t afford to make edits on the live site. Believe me, this was way more anxiety-inducing than it needed to be so the staging server was a big selling point for me. I’m easily able to push the Live site to Staging and vice versa when I need to make changes or add new page types like this eCommerce page, for example. While SSL is purportedly a ranking factor, I’ve yet to really see it have an impact on sites immediately. While that was a small impetus because I like to have every advantage I can when ranking websites, it wasn’t strong enough of a driver to make me switch Credo over to SSL. However, trust is strong enough of a factor because trust means you earn more business, and more business is always good. 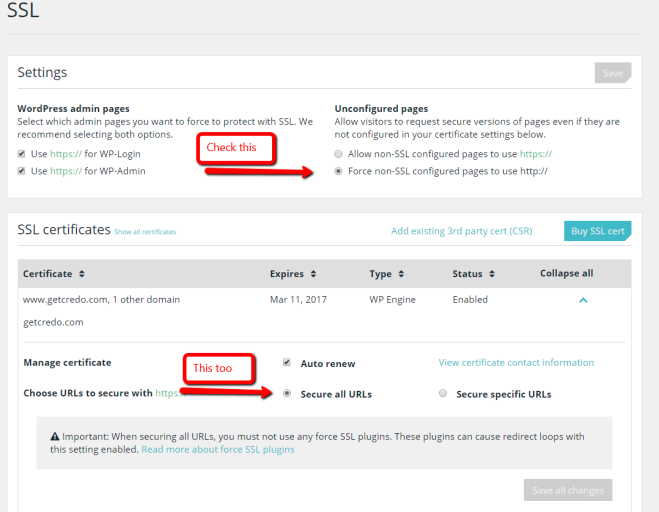 WPengine sells SSL certificates through RapidSSL, so while they’re skimming a profit off the top they also take care of setting (almost) everything up for you so that it (almost) just works. No tool is perfect, so in the interest of transparency I want to point out a few areas that WPengine is less amenable than my past hosting. I’ll be honest – I really liked paying a small amount per month for hosting. I’m not a supergeek when it comes to website speed and I don’t get great joy from optimizing little things to make them go faster unless they are going to make me money. WPengine is undoubtedly more expensive than my past hosts, on the order of about 8x more than having two separate hosts like I did before. The convenience is more than worth it and all of the reasons I mentioned in the top part of this post made switching to WPengine more than worth it. WPengine is definitely the most expensive in the set, but also as an entpreneur and business builder I love that they are not embroiled in the race to the bottom. They’re a premium product charging premium prices. When I purchased my SSL through them, they configured it and set all URLs live on HTTPS without my knowledge or permission. I expected that they would tell me it was ready and then let me decide when to push it live, but unfortunately they did not. It was only live this way for about 24h and not linked from anywhere, so I don’t think any harm was done. Regardless, it could be an issue for other non-professional-SEO customers. When I moved this site (my personal site) over to WPE, I did not know to update my site’s URL setting within the staging environment to my domain before deploying the site live. Because of this, I was unable to access my WP-ADMIN for about two hours until I got in touch with support and they manually reset it. It would be nice to know ahead of time that this is required. When a person is moving more than one domain over you only make that mistake once, but what about those customers who only move one? Update all mentions of the staging server domain to the main domain when the site is pushed live, regardless of how the link was created. The final limitation I have come across recently is the staging server, which is a bit ironic since it’s one of the big reasons I chose to move to WPengine. There are a few limitations I have found to the staging environment on WPengine as it currently stands. Not all changes always get carried over. A few times I’ve had my Custom.css or theme CSS not carry over to the live site when it’s been edited on the staging site. This has resulted in some short term CSS layout issues on the site until I could copy/paste the CSS directly to the live site, which I hate doing. On a marketplace site like Credo where others are able to log in and edit info (eg agencies edit their profiles and provide rich data on themselves), I often run the risk of overwriting something when I didn’t know that they had edited their profile or that a review was left. Instead of just providing some general ways to push things live, like all types of tables or just specific ones, it would be great to have the ability to just push live only updated tables and leave everything else the same. All in all, I am very glad I chose to upgrade my hosting and go with WPengine over my previous hosts. The goods definitely outweight the cons, and with the few things mentioned here fixed I’d be an even happier customer. Good to see you made the investment in WP Engine. I used them for years, but moved away because of their overage charge policy. Be careful there, because they knowingly charge you for bot traffic. Moved to Pagely (similar value prop to WP Engine) and love it so much. The only thing I would say is for your comparison tables should be updated to include Pagely, because it’s the only apples to apples product out there. Jeff – thanks for the Pagely recommendation! Not seen them before. I am aware of the issues that people have had in the past with WPengine charging for bot traffic, but they’ve fixed that as of some months ago, so I’m not concerned about it. That was actually something I was worried about, but then saw that they’ve remedied and so I went with them. Hi John, I am happy to have read your article. I was also thinking of changing my hosting site. Thanks for giving a fair review of WPenguine. WPEngine is always recommended. But have you consider about your own VPS, you have full access, install any software you need, and don’t have to worry about limitation of shared hosting. When you run a business that relies on your website’s uptime, it’s important to have a fast, reliable website host. I still remember a few years ago when I had a personal website back in college, and my hosting company’s servers got struck by lightning. Luckily I had a backup of my website on my local computer!